"The nosferatu do not die like the bee when he sting once. He is only stronger; and being stronger, have yet more power to work evil." 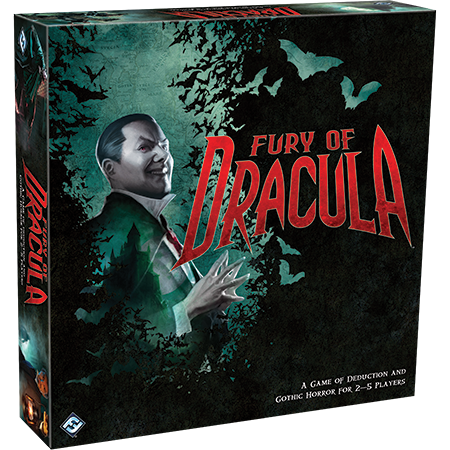 Fantasy Flight Games recently announced the upcoming release of Fury of Dracula, an updated third edition of the classic board game of deduction and gothic horror. Originally released by Games Workshop in 1987, Fury of Dracula challenges players to outmaneuver each other throughout an epic game of cat-and-mouse. One player assumes the role of Count Dracula, who travels throughout Europe, seeking to spread his evil influence, and up to four players assume the roles of those renowned hunters who dare to locate and confront the powerful vampire. This game was rebooted by Fantasy Flight Games with a second edition in 2006, and though it has been out of print for years, it has remained a favorite of fans everywhere. You can learn more about this beloved board game from our Fury of Dracula highlight video. Soon, with the upcoming release of a third edition of Fury of Dracula, the world will once again have cause to fear history's most terrifying vampire. Featuring updated art and adjustments to the rules that make them more intuitive, thematic, and streamlined, Fury of Dracula is currently available for demos at Gen Con Indy. If you're at the show, be sure to stop by our booth and try your hand as a hunter. If you're not at the show, be sure to check our website for future previews and other news about Fury of Dracula!